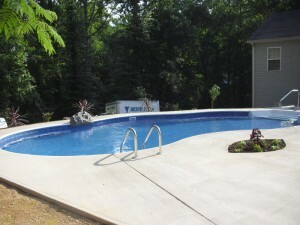 Our pool financing options can make your swimming pool dreams a reality in Spartanburg. Pool Financing in Spartanburg – Do you wish you could add a swimming pool to your backyard, but you aren’t sure you can come up with the cash? Do you need a new pool liner, but aren’t sure how to pay for the installation? When you want to purchase a new swimming pool or need swimming pool repair, come to us at Ricky’s Pools because we offer convenient pool financing to meet your needs. When you are tired of visiting your neighbor’s house to go swimming in the summer, or your kids keep asking you if they can have their own swimming pool for their summer break, you may be wondering how you are going to make a swimming pool your newest addition. Luckily, with our pool financing options, you can choose from a number of our above-ground and in-ground swimming pools to meet your needs. You won’t have to worry about any of the details because we provide complete servicing, and our pool financing options make your swimming pool dreams a reality. Additionally, when you need major swimming pool repairs before your pool opens for the summer, our team at Ricky’s Pools has what you need! Ask us about our swimming pool liners and swimming pool remodeling options that will keep your pool looking its best all season long. Our convenient pool financing options make your pool repairs an easy choice. Contact us at Ricky’s Pools to find out more about how our pool financing can work for you in Spartanburg, South Carolina. We look forward to hearing from you! We now offer 100% financing through LightStream.